A big, bright, clean space within walking distance to everything you might need! The suite has two large bedrooms with queen bedroom sets, a fold away cot, a large fully stocked kitchen, a dining table and six chairs, a breakfast bar, an outdoor patio area, a large flat screen TV with Netflix in the living room, a washer & dryer, dishwasher, cable TV, high speed wireless internet, A/C & heat, keyless entry, easy self check in, and driveway parking for one vehicle. Towels, bed linens, hand soap, clothing detergent, dryer sheets, salt, pepper, coffee, sugar, and cleaning supplies are provided. The suite is clean and bright, with a private entry. It's on the creek, and just a short walk to downtown Kelowna, City Park, or the beach. It's in one of the best locations in kelowna. Everything you could need is with in walking distance. It's located in a protected heritage area in the heart of Kelowna, but still a quiet, safe area with beautiful trees and lot's of wildlife. You can often see deer, squirrels, beavers, owls, and ducks. Big White and Silver Star ski resorts are both about an hour away. You can hop on a daily shuttle to Big White Ski Hill right around the corner. It's very close to the hospital, multiple beaches, downtown Kelowna, golf courses, tennis courts, parks, bike and walking trails, and just 20 minutes from Kelowna International Airport. There are plenty of walking/biking trails, shops, restaurants, and cafes all within walking distance. Public transit is close by, and there are shuttles to and from the airport. I should also note, the ceiling is low in some areas, as it is a basement suite. The location couldn’t have been better. Easy walk to awesome restaurants, coffee shops, and boutiques downtown; short walk to the park and beautiful path along the lake. The suit had everything we needed and then some. Only complaint is that there was some noise from upstairs early in the morning. Understandable given it is an older house. We turned our fan on for some white noise and it helped. Overall, great place to stay and would stay again. My family of four love this basement suite! It was very clean and super comfortable. Our family of four had a wonderful six night stay here. 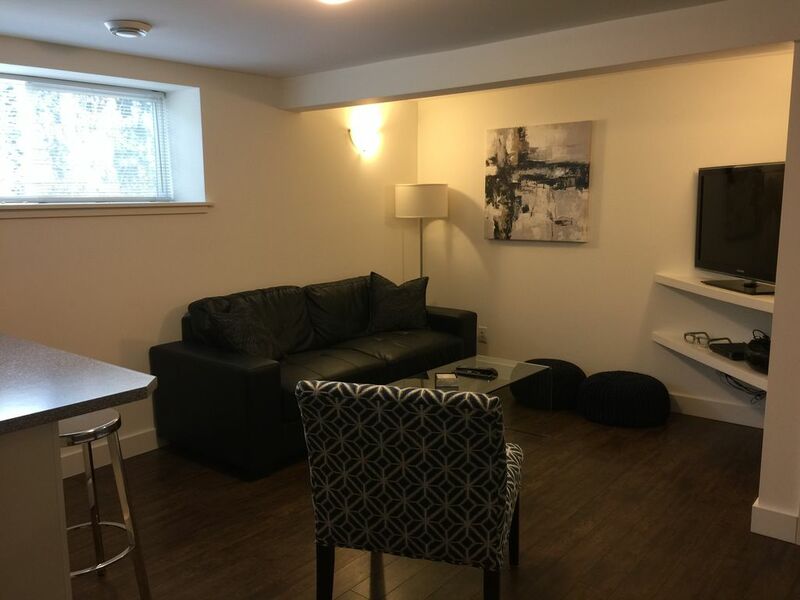 The suite is located in a very quaint, quiet and historic neighbourhood yet just one block from city park and the restaurants and shops that are in downtown Kelowna. It was also less than a 15 minute walk to Kelowna General Hospital. The suite was clean and new with all the modern conveniences. We appreciated the large kitchen table to eat at. The washer and dryer were a big bonus! The beds were extremely comfortable. A couple of considerations might be that if you are sensitive to cold, you may want to bring slippers because of the tile floors. Also, my husband, who is 6' tall, could just walk under the lowest parts of the ceiling without bending over so if you are tall, keep that in mind and watch your head! Thank you for the lovely stay, I would highly recommend this suite to anyone wanting to experience Kelowna's downtown as everything is within easy walking distance. Great family spot close to the action! We loved our stay at this cute little basement suite. Our family of four had lots of space. We were walking distance to City Park which was perfect for our plans this weekend! We would love to stay again! Cute, clean, comfortable & close to everything! We were extremely pleased with our accommodations at this location. After our travels through Canada, this was our favorite place we stayed. Very clean with everything needed for an extended stay. Also, in walking distance to everywhere we wanted to be. If we return to Kelowna, we would like to stay here again! !